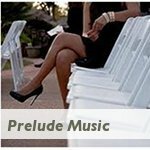 Do you want to make your Wedding Ceremony Music touching and memorable? Of course you do! Your wedding ceremony songs are so important because your ceremony is often the most emotional (and important) part of your wedding. The songs you choose to play during different parts of the wedding ceremony to will convey to your family and friends your feelings on love and marriage, your outlook on life in general and the overall formality and theme of the wedding. 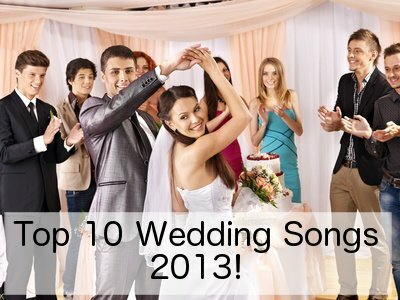 Want to start choosing your wedding ceremony songs right away? You have a clear idea of whether you want live or recorded songs, you know if you want traditional songs or something a little more modern, then pick a "scene" from your ceremony and start choosing! 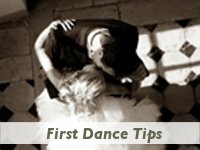 If you are not sure where to start of you just want to make sure you plan everything exactly right, then start with some of the most important decisions first to get a clear idea of how to plan your ceremony music. The first decision you will need to make is whether you want to go with traditional ceremony music or modern and contemporary ceremony music. 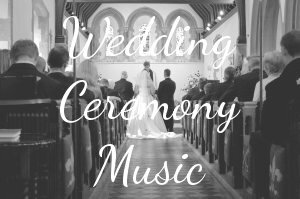 Often this is dictated by your choice of ceremony venue as many churches and religions have strict rules as to what music is appropriate for wedding ceremonies and what they will allow played in the church. Please check on this with your officiant before setting your heart on any specific ceremony song. Your second decision when choosing your music for your wedding ceremony is whether to go with live music or a recording of the songs, or even a combination. Live music can add that extra touch to your ceremony whether it be an organ player, piano, string quartet, jazz ensemble, solo saxophone harp, solo vocalist or a full choir. It all depends on you and what mood you want to create. You can of course also have a combination of live music and a recording. 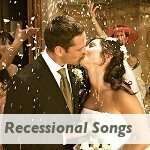 This is often necessary if your live musicians cannot play or sing some of the songs you would like for your ceremony. The third decision is where you will want to have music during the ceremony. This is also often dictated by church rules or religious customs, so be sure to check on the guidelines before deciding. For example, if you are not having a religious ceremony, you will not want to include hymns and you may or may not want a unity candle (or sand ceremony) during your wedding ceremony, and even if you do include it, you may not want music during this time and would prefer your officiant to explain everything while you perform it. This is the time before the wedding ceremony actually starts. 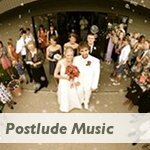 Guests are arriving at the church or ceremony venue and you want to greet them with some light music to set the tone for this important step you will be taking in your life. Allow for around half an hour of music. These days it is quite rare to find weddings with long processionals that include the parents and other members of the family who are not part of the wedding party. Often you would only have the entrance of the bridesmaids to a specific song and then finally a song for the entrance of the bride. 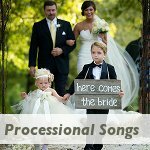 If you are having a Christian ceremony then you might want to include a joyful hymn or two in your ceremony. 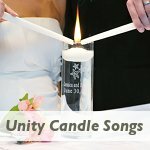 The unity candle is a lovely little part of the ceremony that you can include in religious and non-religious ceremonies as a symbolic union of two hearts/souls/families. Choose a meaningful lyrical song or something pretty and instrumental. Walk back down the aisle as a married couple with a celebratory song and exit the church to a shower of confetti, petals or bubbles. Choose a joyful song for this part. After your processional your guests will still be milling around the ceremony venue, perhaps congratulating you, catching up with each other or finding their car keys. Provide around 20 minutes of music here on a joyful note to see them off. 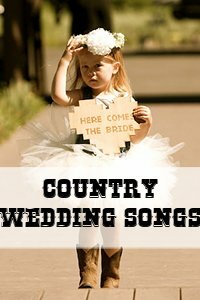 Follow the links above if you want to plan a specific part of your wedding ceremony music and you need advice and song suggestions.